These Super Bright Slow Flashing LEDs come Fully Assembled and ready to use with your track power. Extra wire! There is 14" of wire between the bulb and the electronic unit. 3" of wire after. 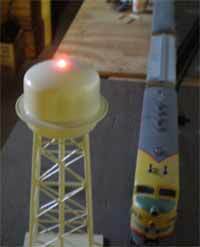 This lets you put the bulb in place by pushing it up through the bottom of your water tower, radio tower, bridge abutment, building, or other structure. No need to take the roof off! These Warning Beacon Flashing LEDs come fully pre-assembled and look great on Water Towers, Smoke Stacks and Bridges, Electrical Transmission Towers, or Radio Towers. This is a nice slow flash rate for many warning beacon uses. Connect these LEDs to any track power source: AC DC or DCC, or connect them to a battery or 12V wall adapter. They will work great with 7-19 Volts of Power. even more important, you cannot cause a short circuit even if you forget or miss-apply your shrink tube. The connections cannot physically touch each other if cut that way! Contact Us for more options, and for larger volume orders. Visit our Gallery to see examples of LEDs in use. "loved the LEDs and you can tell because I am ordering more!"